Hung is our guide, another 20 something Vietnamese tour master. I say that with complete respect because although he may know nothing about the world beyond the borders of his own country he is extremely knowledgeable about (particularly) the Sapa Valley region of Vietnam and very well versed on the rest of his homeland. Our driver is named Tu and as I write this, 24 hours after meeting him, he has not said a single word in any language to us or indicated any kind of expression at all. 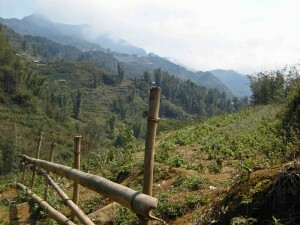 The first area we stopped is known as Trung Chai Valley and is a stellar example of what is typical here, an open valley, generously terraced for farming, quite lush in plant life considering that this is the “dry” season, surrounded by mountains with low lying clouds and fog drifting in and out, moment to moment. As I stepped out of our vehicle the cool air felt wonderful to me but it was the fog that I found so hypnotic as it billowed and subsided through the valley giving the whole scene a very mysterious tone. I hoped it would clear for the sake of our trekking but for now I was captivated and very content with its presence. 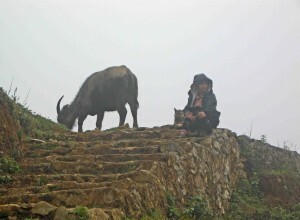 Sapa is a frontier town in Lao Cai Province in Northwestern Vietnam. 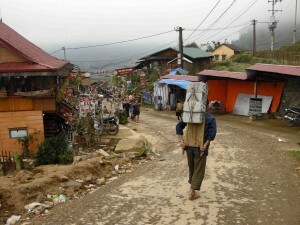 The population is close to 150,000 and includes several minority ethnic groups like the Black H’Mong, Red Dao, Pho Lu and Tay. The town lies in the mountain; I say it that way because it seems to be built into the slope of the mountain, not in the valley at the bottom and not on top of the mountain, more like all points in between. We assembled in Hung’s office in town then headed out for what he called a two and a half kilometer walk. I don’t know how he measures distance but I walk a lot at home and I would say this walk was more like six kilometres. I certainly don’t mind that in any way, I just found it a little humourous that he would be that far off. Maybe he assumes that many people would balk at a six kilometer walk but knew that once he had you on the voyage few would complain and demand it cease immediately. It was eerie at first as we walked down the hill into the village in heavy fog. 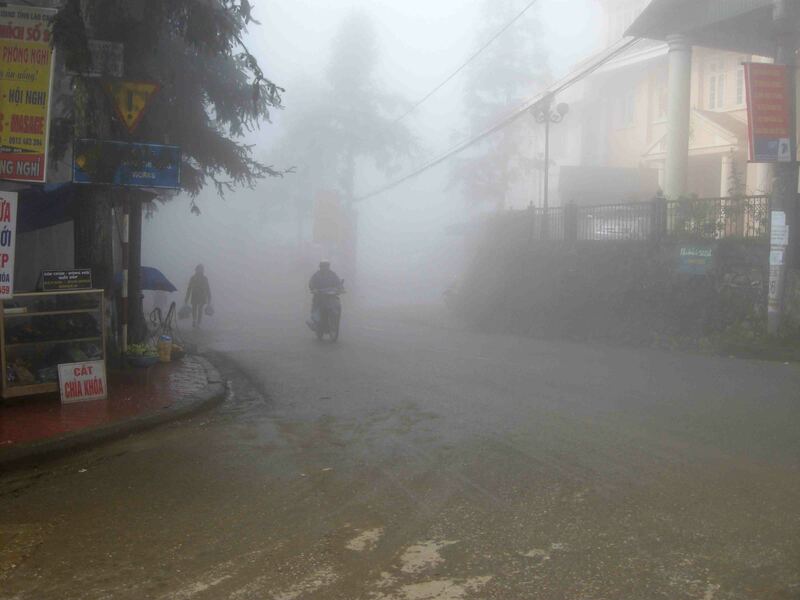 We had just been getting used to maneuvering in the Vietnam motorcycle traffic and now we had to contend with the machines appearing out of this thick blanket of white vapour. People and cars also materialized magically. It slowly dissipated and before long we were bathed in bright sunshine, noteworthy for us because this was the first time in six days we had seen the sun. Our joy was short lived as we walked through the market into the fog once again, along a dirt road, now slick with mud toward Cat Cat, a small community down in the valley. 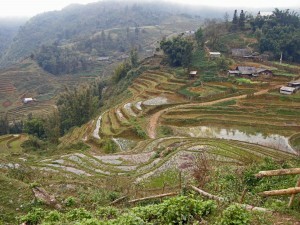 Located 3 kilometres south of Sapa (see, we’re already past 2 ½ kilometres) it was a steep and beautiful hike down. 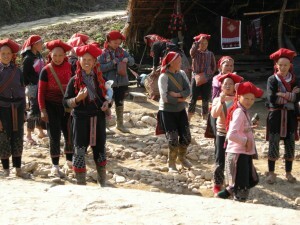 The Black H’Mong that have settled in the village are shy and private people but are very welcoming to visitors. This is one busy spot. There seems to be an inordinate amount of brickwork going on at the moment so I asked Hung about it and he explained that someone was building a how. A how? It took a while but eventually I was able to determine that he meant a house and was just not pronouncing the “s”. There were lots of things we would have to get used to as we made our way through the village. Certainly the people and the language were different but customs and culture dictate a totally different life style than what we are accustomed to. The terraced fields were almost breathtaking as we got a panoramic view but both Karen and I were taken aback at the realization of how incredibly labour intensive maintenance of these growing fields must be. The steps of land seemed to go on forever into the valley. We also noted the livestock, particularly large black pigs and water buffalo, were everywhere we turned. Oh yes, and the marijuana growing freely in the streets got my attention too! A short trail led to a waterfall nestled in the ravine below. It seemed to be separate from the village but shared the Cat Cat name. Their ingenious water transfer system utilizing bamboo sluiceways is archaically brilliant and assists them in producing the dyes used in the creation of their own signature clothing – designer duds right here in rural Vietnam. There is also a small hydro power station near the base of the falls harnessing its natural resources. A steep set of stone steps brought us back up to an intermediary level in the valley where we were treated to more spectacular views. From this point we climbed a steep concrete path (we could have hailed one of many local motorcycles for a ride up but I would not put them through that) up to the road where Tu was waiting in the SUV. While we were eating lunch the fog cleared and it was a gorgeous day when we stepped outside the restaurant. We were finally able to see what Sapa looked like and because we were about to climb a mountain this was a stroke of good fortune judging by what we had heard about the weather around here. Hamrong Mountain is right in the centre of the town of Sapa. Hung advised us that the path to the top was steep and there were lots of steps but we would expect nothing less. He said it should take just over an hour to get to the observation deck at the top. 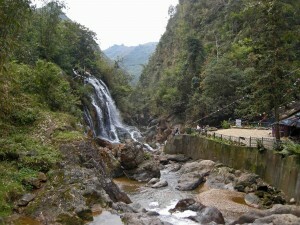 Along the way we would pass through an orchid garden and several rock gardens and get some wonderful views of the town. Starting in the garden at about 1600 metres altitude we stopped several times and experienced labored breathing on occasion as we ascended to the deck at about 2000 metres. The passageway through the volcanic rock was perilously narrow in spots but somehow I made it through; good thing because I don’t think Hung brought the bacon grease. The observation tower did not look that far away from where we stood, however, it did appear that any course to get there was certainly going to be very steep indeed. Somehow we managed to do it in about 50 minutes, a good 10 minutes less than most people do – just what the hell is going on here that we could possibly do this faster than others do? The panoramic view from the deck at San May, the Cloud Yard, was astounding and made any discomfort we had suffered well worthwhile. Ham Rong means Dragon’s Jaw, so called for the rock formation seen at the top of the mountain; it really does look like a dragon with its mouth open barring its teeth – or maybe a turtle. The drive from Sapa to the Topas Ecolodge where we were staying afforded amazing views of the area we would be trekking tomorrow so we were getting excited about that. The road rapidly changed from a reasonably level gravel road to what can only be described as being like an earthquake ravaged, bombed out war zone. What a mess! One would be hard pressed to call this a road at all. The mud was soft and the ruts were deep, and this is the dry season! What can this possibly look like in the rainy season? It would be totally impassable. The lodge is operated with a responsible and sustainable commitment to nature and to the people living in the area. It is a long term cooperation between a Vietnamese and Danish travel company since 2003. They wanted to offer a comfortable stay for their guests in a remote area but not too far removed from the local life – they have certainly accomplished that. “Yes, later, Friday.” I should be safely in Saigon by then. At first we attempted to learn how to say, “No thank you” in Vietnamese but the onslaught was so insistent that an endless chorus of “No thank you” in English is what we went with. This was just the beginning. We were given a map of the grounds with instructions on how to get to our accommodations. This always disturbs me and makes me think of nothing but trouble. In this case it was not so much that it was difficult as it was that it was such a long way, probably about three quarters of a kilometer from reception. Because the lodge is so in tune with the environment each room is a separate hand carved white granite stone bungalow built on site by the masons themselves. The stone pathway leading from reception is very rough and uneven so extreme caution is required. Thankfully a local man has taken our large backpacks on ahead. The path winds its way onward and upward to the restaurant which is about half way between the front desk and our room. One good thing about this is we won’t have to bug them at the front desk. We usually phone and ask them all sorts of stupid things after we arrive in our room but there is no phone and I’m sure not going to be walking back out.